Senior Lecturer in City's Department of Mathematics receives recognition for Socio and Econophysics from the German Physical Society (DPG). 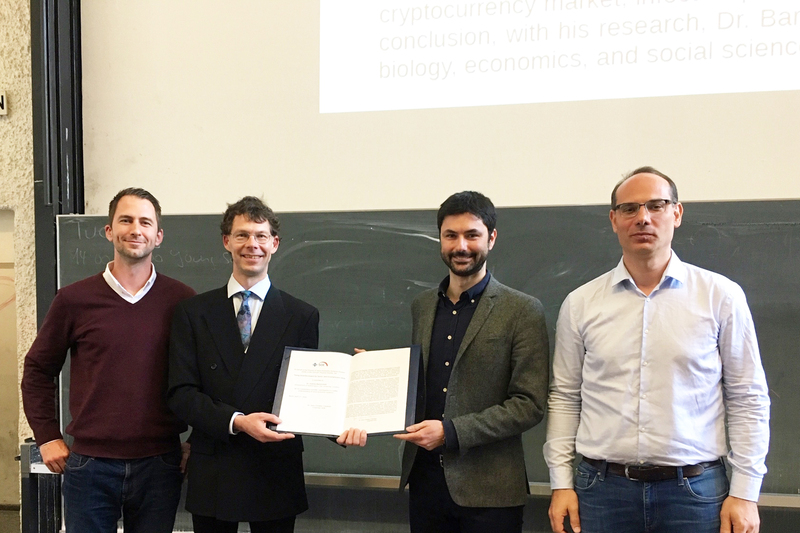 Dr Andrea Baronchelli, a Senior Lecturer in City's Department of Mathematics, has been awarded the prestigious Young Scientist Award for Socio and Econophysics, at the Spring meeting of the German Physical Society (DPG) in Regensburg. The prize recognizes “outstanding original contributions using physical methods to develop a better understanding of socio-economic problems”. Dr Baronchelli is the 18th awardee of the €5000 prize, which the DPG has endowed since 2002 to encourage socio-economic research. With a strong interest in modelling the emerging global properties of social and cognitive systems, Dr Baronchelli has carried out research into several areas, including: the emergence and dynamics of social consensus; the self-organisation of the crypto currency ecosystem; the human exploration of physical and mental spaces; and the collective dynamics operating within online and offline social networks. At a more fundamental level, his research focuses on the study of complex networks and the way they affect the dynamic processes taking place upon them. Andrea’s work has been frequently featured in major press outlets such as The New York Times, The Economist, Science and Scientific American. He plays a central role in the UK Complex Systems community, organising several events aimed at academics and the general public. These include the London Computational Social Science Initiative, Data Natives and the Data Beers. The German Physical Society (Deutsche Physikalische Gesellschaft, DPG) is the world's largest organization of physicists with a worldwide membership of 61,954 researchers, as of 2018.